The Simplehuman Grocery Bag Holder, provides a simple solution to a great source of clutter in many homes – the mini mountain of grocery bags we collect along the way! It has a contemporary appearance and will look attractive if you are hanging it in plain site or you can of course choose to position it inside a broom closet or kitchen cabinet. 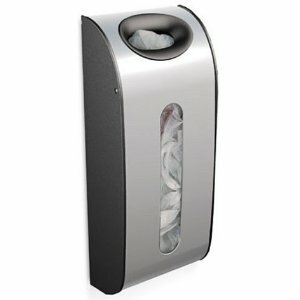 The Simplehuman Grocery Bag Holder holds up to 30 bags and is made from stainless steel and polypropylene. This unit is suitable for wall mounting, as I have said and both screws and double sided tape as included for this purpose. Using a grocery bag holder encourages us to store and reuse the plastic bags that we collect as we may be otherwise tempted to dispose of them to reduce clutter. Now we can be eco-friendly and thrifty! The Simplehuman Grocery Bag Holder is currently (at time of writing) on sale at Amazon for only $9.99.